Tickets are officially on sale for the BISFed 2018 World Boccia Championships. Buy tickets here! March has seen some top competitive boccia. At the start of the month we were in Gateshead for some brilliant boccia at the last of the Heathcoat Cup rounds. Thanks to our partner 'Smile Through Sport' for their support on the day. Next, we were in Sheffield and Hatfield for the thrilling BE Cup Playoffs North & South gearing up for the BE Cup Finals in May. 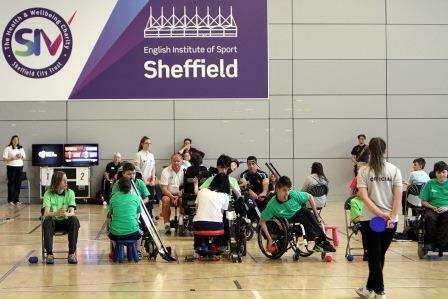 We are now looking forward to the Lord's Taverners Boccia School Finals on the 20 April, the Heathcoat Cup Finals on 21 April and the Super League Fixture Day 3 on 22 April. Keep updated on all the action and live results via our website/ social media. Spectators are always welcome. Our England Performance Group Head Coach, Barry Bowden, has recently stepped down from his role. Barry's contribution to the players and the system itself has been invaluable over the many years that he has been involved in the sport. Athletes and coaches look up to Barry and it is our belief that his personable approach to coaching is something we can all learn from. From everyone at Boccia England, thank you Barry for making such a difference to the sport and the people within it. Level 1 Award in Officiating, last few places available! Cost: £15 per person deposit to secure your place. FREE referee's paddle upon completion of volunteering activity. It's that time of year again and your chance to nominate your boccia sporting hero. Nominations must be received by Tuesday 1st May 2018. Find out more and nominate now. Raffle/Tombola Prizes! Can you help? We're looking for donations of prizes for our raffle and tombolas at events throughout the competition season. If you or anyone you know can help please contact Susannah Wakefield on 0115 9678455 or info@bocciaengland.org.uk Thank you for your support! All funds raised go back into our competitions! Boccia England is a registered charity (reg. number 1139174) and since our beginnings we are working hard to develop the sport and create more opportunities to play boccia.